Saturday, June 8, departing at 7:30am (7:00am from the subway). Cost: ¥360 / ¥325 for members; Difficulty Level 3. In Brief: A long but not difficult ramble along country trails and lanes through pine forests, cornfields, orchards, villages, and farmland in Miyun District. 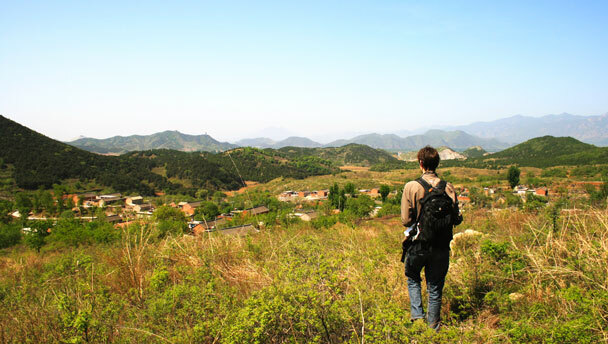 A view of Stonewall Village, nestled in the rolling hills of Miyun District. 3–4 hours start to finish over 13km. 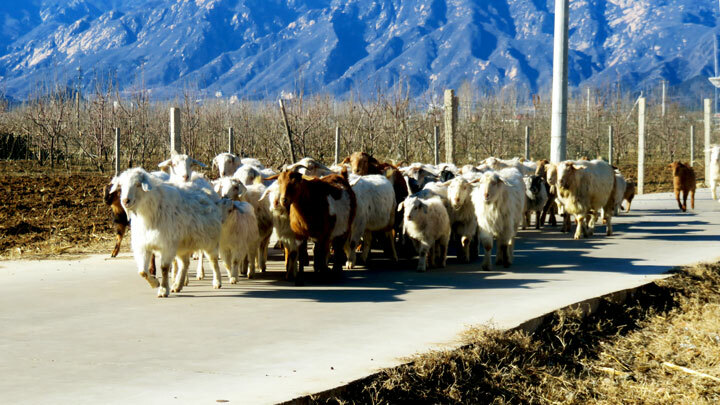 This trail took us five scouting trips to put together and covers a wide range of countryside scenery, including country trails and lanes, pine forests, orchards, farmland, a reservoir, the Stonewall Village, and a chicken farm, and we may see some shepherds rambling about as well. We’ll start off following a lane up to a small village nestled in a valley. From there we will follow a patchy trail over the hill to the Stonewall Village, named for the rocks on the bare hill that protect it from northerly winds – some say it looks a bit like Dartmoor in England. Branching off the lane that leads away from Stonewall Village is a hidden trail that will soon lead us to a clear path through the pine forest. 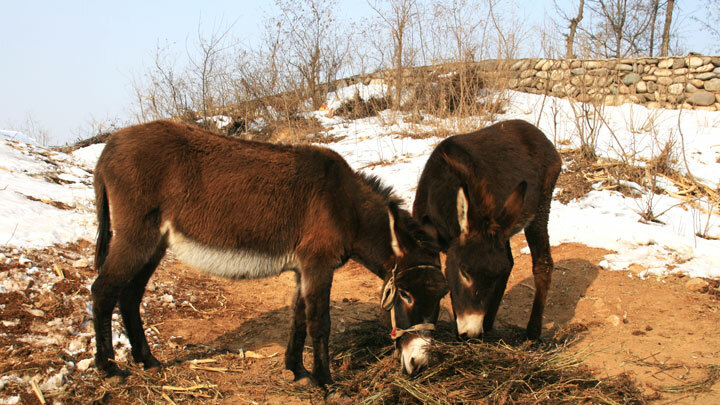 The forest floor is has a thick covering of pine needles, and villagers often come to the forest to collect firewood. On one of our scouting trips we lost the trail, but after following the sound of breaking twigs we found a few farmers collecting firewood, and they were able to get us back on track. 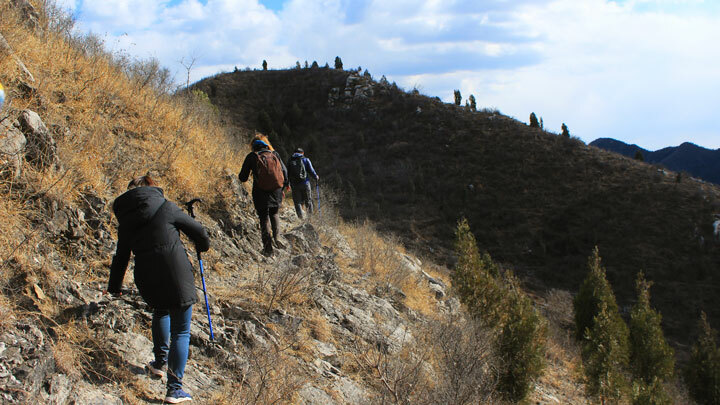 The trail leads out of the forest and follows a zig-zag path past an aqueduct and through farmland, and will take us up the rolling hills to a clear and open ridge. There are some great views to be had at this point, and it’s not likely we will see many people about. 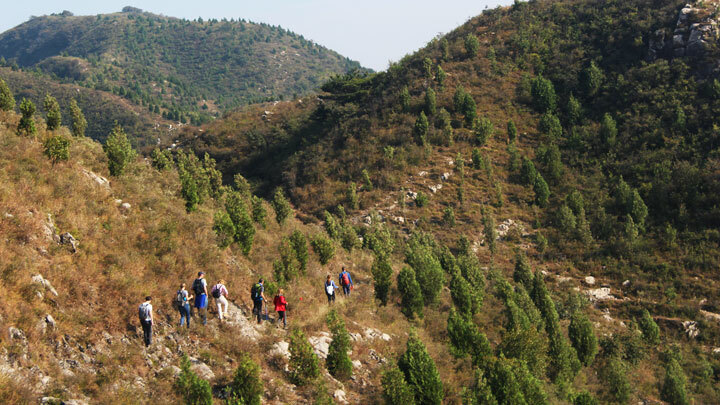 This walk is quite long, but it’s not difficult – there is not a lot of climbing up and down. The views are excellent, and the sparse population makes it a very peaceful area to walk in. Note: the trail could get rather brushy in places – we recommend you wear trousers to protect your legs. 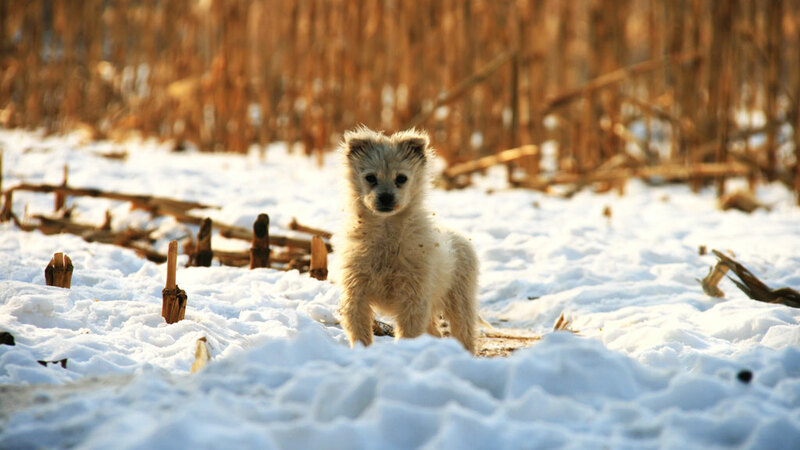 Parts of the trail will be brushy and scratchy, particularly if the hike is scheduled during summer. 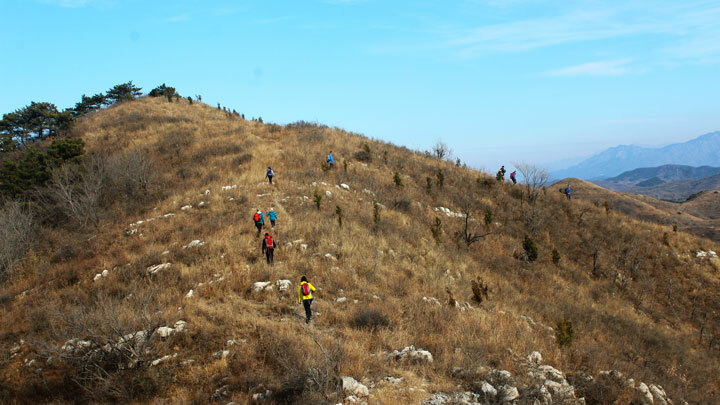 The Rolling Hills and Empty Lanes hike is a long ramble through the Miyun countryside—see 27 photos. 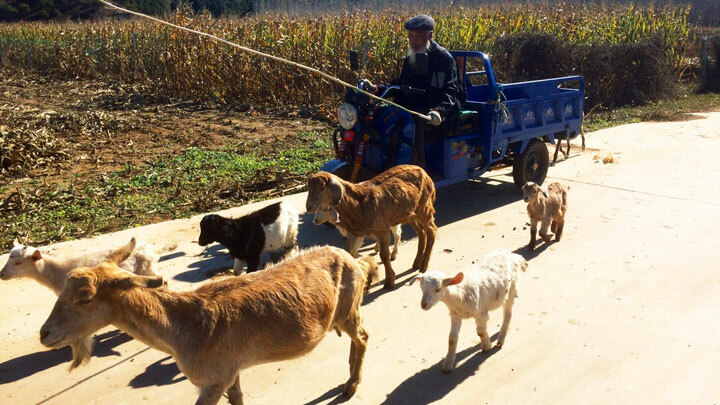 See 18 photos from a drizzly day in the rolling hills of Miyun—clouds, cabbages, cornfields, and more! 20+ photos from a long ramble through the hills of Miyun—snow shots, farmland views, and more! 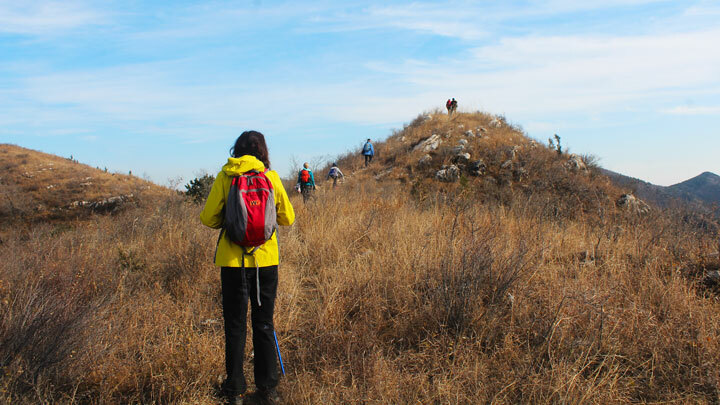 Twenty-two photos from a long but easy walk through the rolling hills by the Miyun Reservoir. 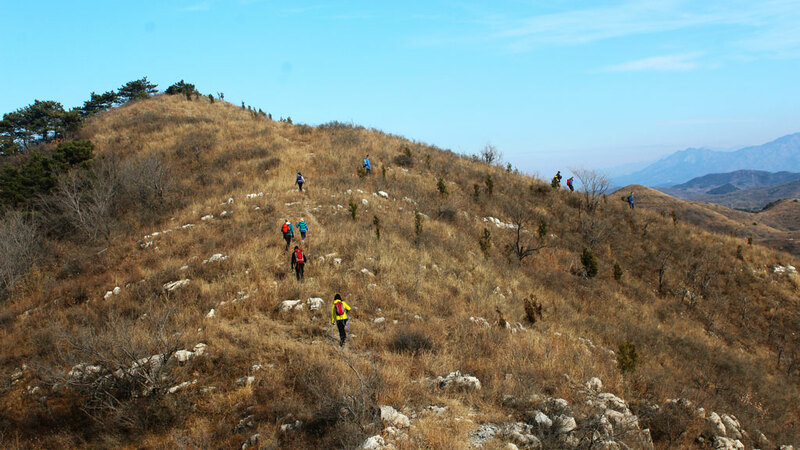 Photos from a relaxed ramble in the hills of Miyun County. Our original plan for this date was to visit Dragon Cloud Mountain, but heavy snow the day before meant that we couldn’t get there. We thought that the easier version of our Rolling Hills hike might be a nice one in the snow, and we were right – click through to see photos!